Guy De Bièvre (BE) is a composer, musician, sound designer and sound art curator. His music has been commissioned and/or performed by musicians such as Guy Klucevsek, Seth Josel, Anne La Berge, The Bozza Mansion Project, Zivatar Trio, Zwerm and various local and international organizations. 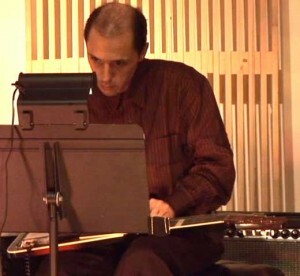 As a composer/performer (guitar, lap steel and electronics) he focusses on open form composition, which was also the topic of his PhD at the School of Arts, Brunel University, London. He performed internationally, both solo and with musicians/composers like Anne La Berge, Phill Niblock, Peter Zummo, Tom Hamilton, etc. Next to all this he is teaching (“ear cleaning“ at RITS in Brussels and occasionally guest-teaching in various local and international schools, e.g. TU Berlin, Brunel University London, Seam Weimar, KASK Gent), freelancing as a writer, sound engineer, sound designer and consultant. He was the curator of the audio art series Earwitness at CCNOA (Centre for Contemporary Non Objective Art) in Brussels and of the Culture Mile in Enschede, Holland (first instalment in November 2008 (Bill Fontana)). Guy was mentored in soundwalking by Hildegard Westerkamp, back in 2002.